More food and another love note from me! This week it was PACKED and HEAVY! I’m so excited! I tried to clean out my fridge each Tuesday night or Wednesday morning, but I didn’t even come close to making enough room this week! For something a bit different this week I’m also going to put some storage ideas instead of recipes for some of these veggies. I’ve exhausted some of what I have!!! 😉 Or you probably don’t really need any more ideas how to use onions or green peppers… at least those veggies are a permanent fixture on my grocery list… I don’t know about you! 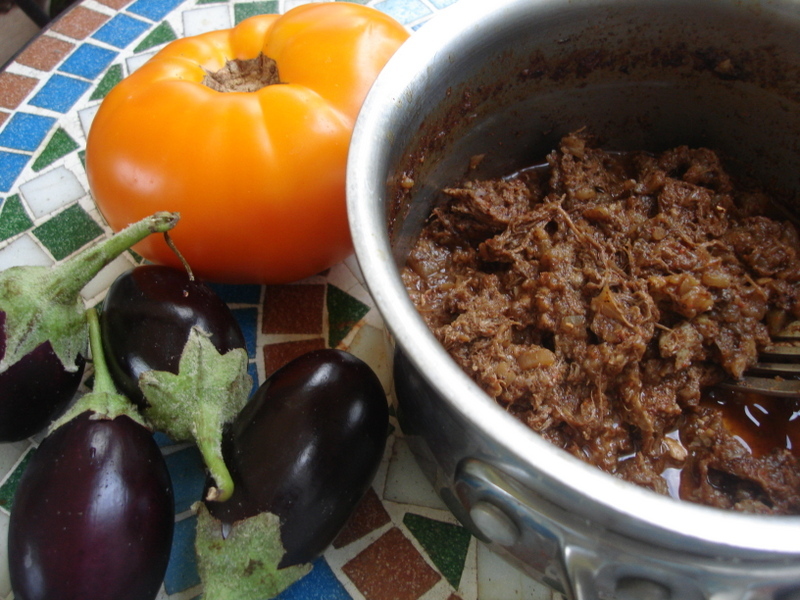 And… as I promised some of you today I’m providing some egg plant recipes! It isn’t usually one of my favorite vegetables, but last year when I had them coming out my ears I did lots of research on how to use them and experimented with them A LOT! So read on for LOTS of ideas for those in particular. Tomatoes – I don’t particularly like cooked tomatoes so we don’t eat a lot of lasagna or spaghetti or cheese shells. I do like pizza and chili though! Often to store extra tomatoes I do a variety of options. I dice some and freeze them for easy adding into chili. I also puree some (seeds, skin and core) in the [amazon_link id=”B008H4SLV6″ target=”_blank” container=”” container_class=”” ]VitaMix[/amazon_link] and cook in the crock pot for a day or two to make tomato sauce and freeze or can. And the final option… I dehydrate them. This is easy storing in the pantry and I just throw a handful into my batch of chili with some extra water and cook them down for 8-12 hours with the rest of the chili ingredients. I’ve also included my chili recipe, but some probably already have their tried and true. In the last year or two I’ve made a HUGE batch so I can freeze some for an easy freezer meal and I usually use 3 lbs of meat. Usually sausage, pork heart and pork liver. It’s a good way to eat the organ meats and it’s cheaper than other cuts, but still adds the protein. Cherry Tomatoes – These too I’ll throw into chili to let them cook down and sometimes I’ll freeze them whole to do the same later in the winter. I’m not a huge fan, but the boys eat them like grapes and LOVE them for an afternoon snack. I like to cut them small and make a pico de gallo or fresh salsa for use in omelets, tex-mex foods, over quesadillas and with chips! Corn – My kids love corn on the cob as I’ve said in the past! But this week I did something a little different and cut it off the cob while it was raw. Then sauteed it in coconut oil and sprinkled (my personal recipe) taco seasoning on it. I served it on taco salad, but It was fantastic by itself. I’m kinda surprised there was any left for dinner. i have also cut if off the cob and frozen it raw for storage. Most places advice you blanch veggies before freezing them… but I never do and they all seem to be just fine! Potatoes – These last well too… just don’t store them next to your onions. Just where we all like to keep them. The onions actually make them rot more quickly. I’m actually thinking of making some hash browns for breakfast in the morning and putting some ground sausage in too! However… I don’t stress trying to eat these by next week because I know we will get to them eventually and they won’t go bad as quickly as the …. EGGPLANT!!!!! Eggplant (Traditional and Asian) – As MANY of you mentioned today you aren’t huge fans of eggplant, nor do you really know of a good way to cook it. As I mentioned earlier I did LOTS of looking last year for good ideas and I found quite a few. I plan to do some of these this year, but plan on looking up some new ones as well. As I find more I’ll be sure to share them as well, and PLEASE share what you find with the rest of us too! So here are some ideas…. Eggplant dippers (great for kids), paleo vegetarian lasagna, eggplant meatless meatballs, and grilled eggplant with tomatoes basil and feta. Today I made lengua carnitas for topping on the taco salad and I added 2 medium eggplants (pealed and chopped fine) to stretch the meat a little further. It did! And no one knew! Because of the strong taco seasoning flavor it wasn’t detected and since I cooked it for a long time it cooked down to nothing! Cucumbers – Sad to say, but I don’t have any storage ideas for these… EAT THEM! We have them in salads, with hummus, in Tadzhik, with Indian foods. My kids LOVE them and I often cut them to “dill pickle size” as requested by the minions, for raw snacks. Red Onions – Kinda goes with out saying… I love these in my Mediterranean pepper salad. Green Peppers – I NEVER use green peppers. I don’t really like the flavor and much prefer red, yellow or orange! However.. I will NOT let these go to waist! I’m planning on slicing them and freezing them. I’ll then add them to chili where they will cook down and add flavor! Plums – Eat raw! We have them on the table and I think the kids have had about 2 or 3 today! Even baby Xan loves them! Since there were so many in the box I thought about making a plum sauce for pancakes or a simple paleo cake, but I’m not feeling particularly motivated and the kids are loving the fresh fruit that is a change from the usual bananas, oranges and apples that we typically have on hand. 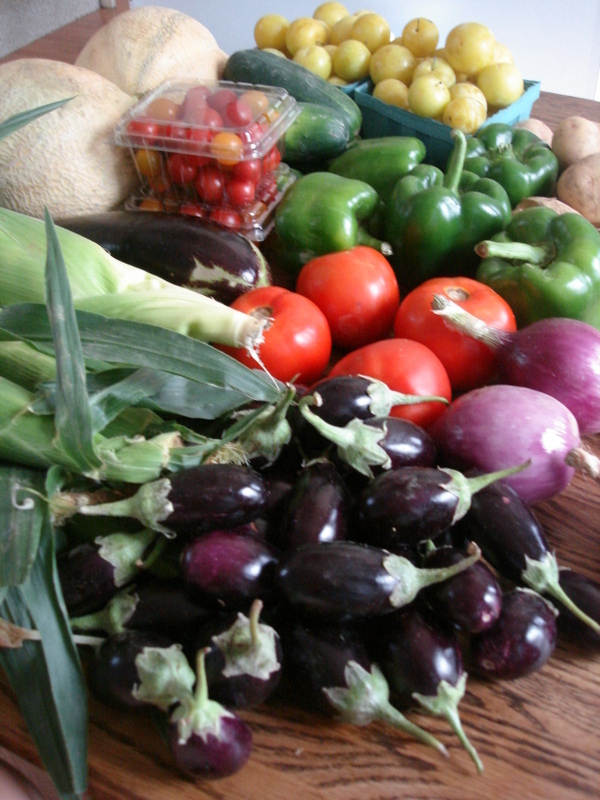 Enjoy another week of fresh produce!! !